The Holy Martyresses Faith, Hope, and Charity were born in Italy. Their mother, Saint Sophia, was a pious Christian widow. Having named her daughters with the names of the three Christian virtues, Saint Sophia raised them up in love for the Lord Jesus Christ. 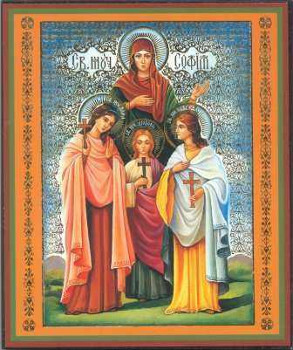 Saint Sophia and her daughters did not hide their faith in Christ and they openly confessed it before everyone. The official Antiochus made denunciation about them to the emperor Adrian (117-138), who ordered that they be brought to Rome. Realising that they would be taken before the emperor, the holy virgins prayed fervently to the Lord Jesus Christ, asking that He should send them the strength not to fear impending torture and death. When the holy virgins with their mother came before the emperor, everyone present was amazed at their composure: it seemed that they had been called out to some happy festivity, rather than to torture. Summoning the sisters in turn, Adrian urged them to offer sacrifice to the goddess Artemis. The young girls (Faith was 12, Hope was 10 and Charity was 9) remained unyielding. Then the emperor gave orders to fiercely torture them: they attempted to burn the holy virgins over an iron grating, they threw them into a red-hot oven and then into a cauldron with boiling tar, but the Lord by His Unseen Power preserved them. The youngest one, Charity, they tied to a wheel and beat at her with canes, until her body was covered all over with bloody welts. And undergoing unreported torments, the holy virgins glorified their Heavenly Bridegroom and remained steadfast in the faith. The tormentors subjected Saint Sophia to another and grievous torture: she was forced to look upon the suffering of her daughters. But she displayed adamant courage and during this whole while she urged the girls to endure the torments in the Name of the Heavenly Bridegroom. All three maidens with joy met their martyr’s end. They were beheaded. In order to intensify the inner suffering of Saint Sophia, the emperor decided to let her take up the bodies of her daughters. She placed their remains in coffins and reverently conveyed them on a wagon beyond the city and buried them on an high place. Saint Sophia sat there for three days not leaving the graves of her daughters, and finally she gave up her soul to the Lord. Believers buried her body there also. The relics of the holy martyresses since the year 777 rest in Alsace, at the church of Saint Trophimus in Eschau. “Faith, Hope, and Charity, holy branches of noble Sophia, by grace made Greek wisdom foolishness. They have contested and won the Victory and have been crowned by Christ the Master of all.” – Kontakion of St Sophia and her Three Daughters, Tone 1.